Guerrilla War (Guevara (ゲバラ, Guevara?) in Japan), is a 1987 arcade game by SNK. 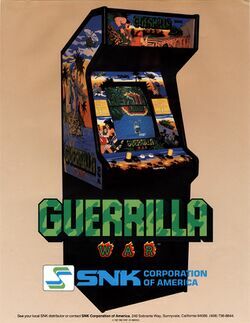 Originally released for arcades in 1987 as a coin-operated arcade game, Guerrilla War followed the adventures of two unnamed rebel commandos (Che Guevara and Fidel Castro in the Japanese version) as they raid an unnamed Caribbean Island in order to free it from the rule of an unnamed tyrannical dictator. Along the way the players vanquish hordes of enemy soldiers while attempting to rescue hostages (with large score deductions for any hostages killed in the crossfire), collecting weapons from troopers and operating tanks. As the original title indicates, the game is based on the exploits of revolutionary Che Guevara, and the defeat of the Batista regime in Cuba in the late 1950s. Player 2 takes the role of Fidel Castro. Nevertheless, fearing anti-Communist sentiments in the West, SNK did a localisation of the game's dialogue and instruction manual for its North American and European releases. The version of Guevara released for the Japanese Famicom is a sought-after item for many video game collectors. The arcade version followed the highly successful format for overhead arcade shooters that SNK had pioneered with its landmark Ikari Warriors (1986). Using eight-way rotary joysticks, the game allowed players to move their character in one direction while rotating the joystick in order to shoot in another. The game was moderately successful, and spawned ports onto home video game systems. In 1988, SNK released home editions on the PC, Amstrad CPC, Commodore 64 and ZX Spectrum home computers, as well as the NES/Famicom 8-bit console. Because of the limits of the home platforms, the home versions did not have the rotating joysticks. However, and unlike Ikari Warriors, the NES/Famicom versions proved to be very well adapted to the system and more popular than the arcade version. The NES version's two-player simultaneous play, unlimited continues, and frantic action gave it an edge over its arcade predecessor. The NES version featured Box cover art by Marc Ericksen, who was also responsible for the cover illustration for Ikari III: The Rescue and SNK's P.O.W. : Prisoners of War. Guerrilla War follows the adventures of two unnamed rebel commandos (known as Che Guevara and Fidel Castro in the Japanese version) as they raid an unnamed Caribbean Island in order to free it from the rule of an unnamed tyrannical dictator. Along the way the players vanquish hordes of enemy soldiers while attempting to rescue hostages (with large score deductions for any hostages killed in the crossfire).